This week the Jay Jays Jayvatar Builder that Visual Jazz created went live. 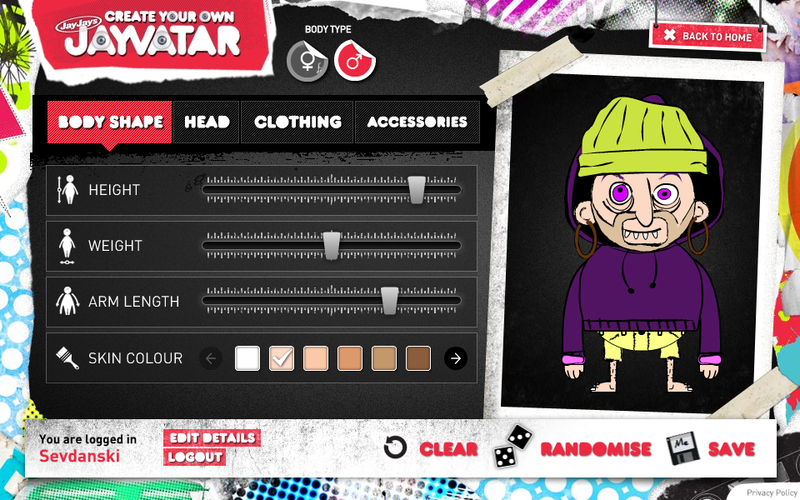 It’s a cool little tool that lets you create your own custom avatar for use on the Jay Jays site. Whith a very unique style and heaps of options you are sure to create some very cooky characters. This first release consists mostly of the Jayvatar builder, which is where you can create your custom jayvatar by combining any of the various pieces of clothing and accessories. You can also choose between male and female body types, as well as different attributes, such as height, weight and arm length. There is even a ‘random’ button for the less visually creative that generates a random jayvatar automatically. Once you have completed creating you Jayvatar, you can save it and share it via facebook, twitter and email. You can also save a version onto your computer for whatever reason you have in mind. You can also play around with your Jayvatar in the Javatar Playground. Here you can make your Jayvatarcan fly around the screen, bump items, crash down, etc. 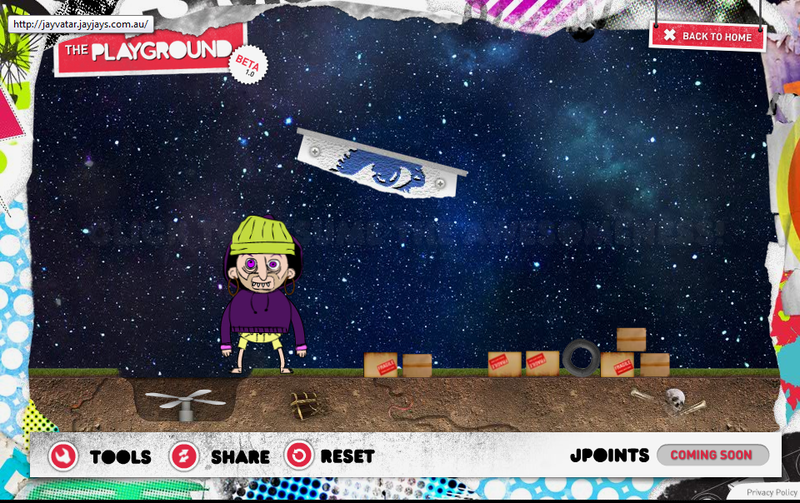 At the moment the playground is just a Beta version so there is only a limited amount of interactivity happening. There full release will allow you to do a lot more. As a bonus, those people from Australia and New Zealand that sign up soon will be given a free $10 voucher to spend in store… BONUS! So what are you waiting for? Head over to the Jay Jays site and create your own..
why did you stop it !!!!!!!!!!!!!!!!!!!! Sorry Riley. Believe me, it wasn’t my decision. I was as upset as you when I found out the site was being changed. I can’t go into details, but I can say it wasn’t a VJ lead change. Ive been told that most of the stuff is still there, it’s just a bit harder to find.